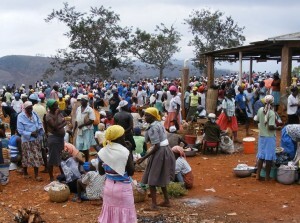 Bartering, buying, socializing and selling at the market in Goyavier. Our next CFTC blog post from Haiti comes from Heather Johnston, CFTC’s Director of Programs and Genevieve Drouin, Regional Program Manager – Americas. On their journey to Goyavier, they were engaged deep in conversation about Haiti’s past and present with CFTC Country Representative for Haiti, Madsen Gachette. 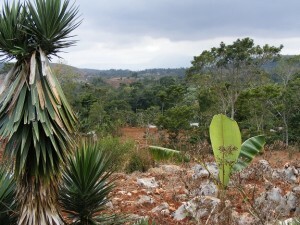 On their first visit to Haiti, the question they find themselves asking is: Why Haiti? Why do natural disasters seem to hit more frequently and cause more destruction? Why – when its neighbour, the Dominican Republic, has developed into a prime tourist destination – is Haiti still mired at the bottom of the world’s development index, its citizens bearing the burden of poverty that is found nowhere else in the region? 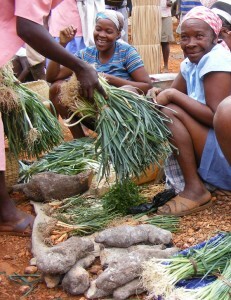 And looking forward: how can CFTC better support our local partners and Haitians themselves to emerge from this poverty? CFTC’s Theory of Change work with local Haitian partners and stakeholders is providing us with new tools to use, collaboratively, with the community and our partners to support long-term change. Ultimately, these people are best placed to identify their own needs and priorities, to come up with the practical solutions that will last, and to turn hope into action for sustainable change and self-sufficiency in Haiti. But first, a short history on Haiti! Goyavier, Haiti, March 12, 2012—Today we get an early start, heading north towards Saint-Marc en route to CFTC partner Service Oecumenique d’Entraide (SOE) in Goyavier. After an hour or so inching through Port-au-Prince traffic, we are finally out on the open road with the mountains on our right and the incredibly inviting turquoise-blue ocean on our left. While Haiti’s tourist industry is non-existent today (there used to be a Club Med here, closed decades ago), I can’t help thinking that this would be the perfect destination for an adventurous traveller looking for some sun, sand and surf. 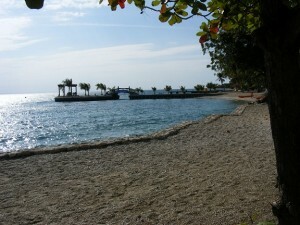 The other two-thirds of the island of Hispaniola belong to the Dominican Republic, a major destination for Canadian tourists on beach vacations. So why not Haiti? Why has the country just next door found peace and security and developed itself as a major tourist destination, while Haiti remains underdeveloped and isolated; the poorest country in the western hemisphere? I ask our ‘tour guide’, Madsen Gachette, CFTC’s Country Representative in Haiti since 2004. Gachette is a treasure trove of knowledge about Haitian culture, history and politics, filling our long car drive stuck in Port-au-Prince traffic with captivating stories of slavery, revolution, political intrigue and bloodshed. Gachette has an answer, but it’s complicated. The most obvious reason for Haiti’s comparative underdevelopment is the continuous onslaught of natural disasters faced by the country: cyclones, hurricanes, tropical storms, and of course, the devastating earthquake of January 2010. But underdevelopment in Haiti is also the result of the colonial period, as French colonizers did little to invest in the country, administering it as a source of natural resources to be exploited. As the first Black nation in the world to gain its independence in 1804, 150 years before the independence of most African nations, Haiti has a rich and proud history of independent thinking and political action. However, the country was ill-prepared for its independence: very few people could read or write, and there was little political, social or economic infrastructure to support the fledgling nation. Convinced that the French would return to reclaim their territory, Haitians developed a ‘siege’ mentality, building forts and armies to protect themselves from potential attacks by their former colonizer. And so Haiti embarked on a violent history of oppression, corruption, class division and external meddling that in many ways continues to this day. Bustling market day in Goyavier! Gachette wraps up his history lesson as we leave the main highway to make the slow climb on a dirt road up into the mountains to Goyavier. Arriving in the village, we find cooler air and crowds of people, music and ambiance: it’s market day and people have arrived from all over to barter and buy, sell and socialize. We take a quick tour of the market. While it’s the dry season and food is scarce, we can still find a good selection of fresh vegetables from local farms: cabbages, onions, tomatoes and beans. Families here in the hilltop village of Goyavier struggle to eke out an agriculture-based living. The main obstacle to their prosperity is lack of water. The nearest water source is two to three hours away by foot. Women and children spend a significant portion of their day making the long trek back and forth, up and down long, rough roads not much more than tracks, carrying water containers on their heads to meet the family’s daily needs. Our partner, SOE, has made important investments in the village to ease the burden of water collection. Many families now have a cement cistern attached to their house that collects the rainwater runoff from the tin roof. If the rainy season is good and the family small, the cistern will supply water for nearly 12 months of the year for drinking, cooking, washing and general household use. Some families also use it to tend small garden plants before they are transferred to larger plots. One of the challenges for our partners is to measure the impact of their interventions. The cisterns have clearly made an enormous difference in the quality of life of these families, particularly for women and children who do the majority of the water collection. The greatest impact is perhaps on hygiene, as water is more readily available for personal washing and cleaning. Madsen Gachette, CFTC’s Country Representative for Haiti, on right with the Datilus family just outside of Goyavier. At CFTC, we recognize the need to better support SOE to capture that impact in a more measured way, to move beyond anecdotal stories of individual families. Have the rates of waterborne disease decreased, particularly diarrhea and cholera? Are families using the water (and soap) to wash their hands regularly? What is the economic benefit to the family to have the water source close by? These are some of the questions we need to be asking systematically to measure the impact of our work and to ensure that we are on the right path to support the development of this community and the country. More to come on that front as our Theory of Change workshop rolls out in Haiti…looking forward to bringing more news as our trip progresses!